More than any other Trek series, Voyager had a steady improvement in quality as it moved in to it's later season, particularly after season 4. Season Six is truly excellent, some of the best of Voyager. The season picks up where the previous left off, with the conclusion to the much underrated Equinox, which really tests the crew's devotion to principle, as the actions of a renegade Starfleet crew result in Voyager being the victim of attack by extra-dimensional entities. Barge of the Dead is a quirky look at the Klingon afterlife, and while not being remarkable, it's still a worthwhile episode. Tenker, Tenor, Doctor, Spy is one of the highlights of the season, as hostile aliens tap in to the Doctors daydreams, where he is the most intelligent, important, and all around greatest crew member. Easily one of the funniest Trek episodes ever. Alice gives us Tom Paris obsessing over an old shuttle, much in the way modern day car guys do with cars. Dragons Teeth give us a memorable species, the Vaadwaur, who had been in cryogenic suspension for 1000 years. the Voyager Conspiracy is an episode of paranoia and second guessing, as Seven thinks that the rpesence of Voyager in the Delta Quadrant is no accident. Pathfinder features guest appearances by Lt. Barclay and Counselor Troi, who become involved in a project to try and establish contact with Voyager via a radical application of subspace radio. Fair Haven gives us the memorable holodeck town of the same name, a 19th century Irish town where the crew can unwind amidst absurd situations. Blink of an Eye has been called one of the most fascinating episodes in Trek history, and that is no understatement. Voyager becomes trapped in orbit of a planet where time moves faster than the rest of the galaxy, and as a result, their society becomes centered around the "sky ship", which they marvel over for thousands of years. Virtuoso is another great Doctor episode, in which he becomes a superstar of a society that has no concept of music. Collective features the Voager crew adopting a group of Borg children, abandoned by the collective. Good Shepherd is Voyagers' "Lower Decks", the famous TNG episode which examined the life of junior officers on the Enterprise. Captain JAneway takes a group of udneracheivers on a Delta Flyer mission where they encounter an unusual alien entity. Live Fast and Prosper is another great comedic episode, in which a small group of con artists masquerade as the Voyager crew in order to pursue illicit transactions. Muse involves B'ellana crashing on an M Class world inhabited by a humanoid species who have a society similar to ancient Greece, and B'ellana is mistaken for a goddess by a poet, who sees her as a muse. Big fan of the series. I now have all 7 seasons. The extras are super and the quality is better than when I saw them when originally broadcasted. Note to Paramount: no sane person is going to pay more than $60 for a DVD set, ever! Wake up Paramount! Take a cue from your sales on the STTNG sets. Now that you have finally come to your senses and dropped the prices on the sets to where they should have been in the FIRST PLACE, I would imagine that all of the hold-outs (like me) are now buying them. See, it works like this, 30 minute shows on DVD, for a season, have earned a fair market price of $25-35. So, since Star Trek episodes are an hour long, that means a fair doubling of the price puts it into the $50-70 range. So, $60 is your sweet spot. 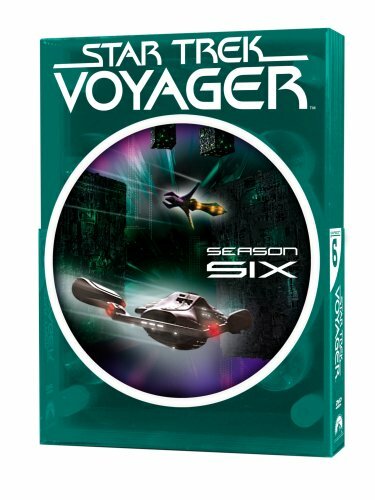 Excellent Season, highlighted by "Pathfinder"
Though my favorite Trek will always be Deep Space Nine, followed by The Next Generation, I give Voyager a lot of credit for growing as a series. When it first started, I found it to be dreadful. It was only after the addition of Seven of Nine that the show became more focused, and the cast really started to gel. By the end of the series' run, I found it a very respectable show and an important part of the Star Trek universe.